Last Labor Day weekend was a beautiful weekend. 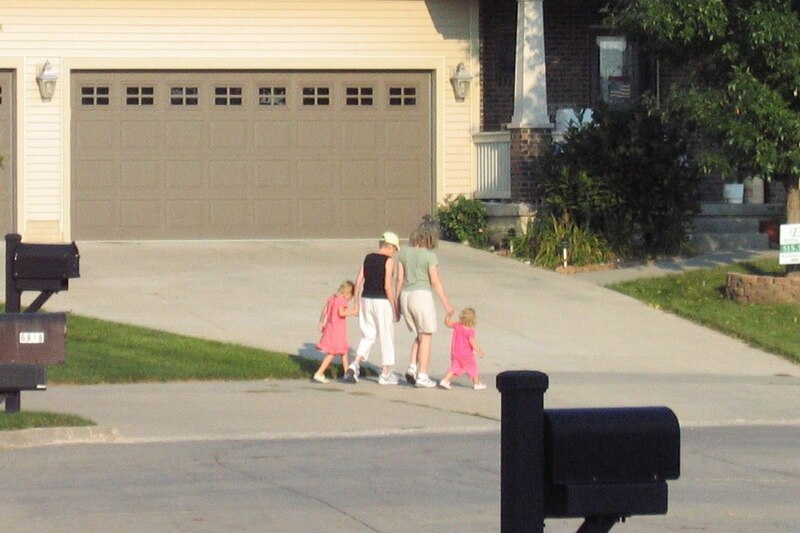 We took Mom out for a couple of walks; here she is with Lily, my sister, and Emmy. Mom is sleeping right now. I’m writing this late Sunday night. Mom slept all day, and we know she might not wake up. I’m dreading my next post. But I need to remember that Mom is in God’s hands now, and so are we. ((HUGS)) That is a sweet picture.I am praying for you, your mother and your family. May God bring peace into your hearts. I love that picture, the two little ones book ending the group.I'm so sorry to hear about your mom. I'll be thinking about you and your family. That is such a sweet picture–all of you holding hands. Praying for you. I am amazed that you have been able to blog through all this.